FILE - A model of an adult Neanderthal male head and shoulders by artist John Gurche on display in the Hall of Human Origins in the Smithsonian Museum of Natural History in Washington, D.C.
What happened to the Neanderthals? After splitting from our African ancestors more than half a million years ago, the Neanderthal branch of our family tree thrived in Europe and Central Asia, developing a sophisticated culture. When modern humans moved into the neighborhood 50,000 to 80,000 years ago, the two groups interbred, producing hybrid offspring, with 50 percent of their genome from each side. Subsequent generations would have a different ratio, but the mix would still include a significant amount of Neanderthal DNA. Today, Neanderthal genes are a tiny fraction of the European genome, just a few percent, and only a bit more common in people of East Asian ancestry. 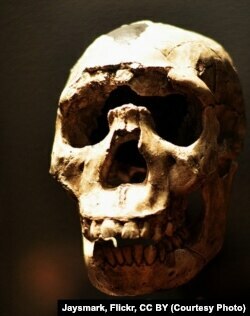 Why did natural selection choose to lose the Neanderthal elements? The idea of 'survival of the fittest' suggests that Neanderthals were genetically incompatible with modern humans, so the hybrids did not thrive, but a new study found a different explanation. Geneticists from the University of California, Davis, say a "weak but widespread selection against Neanderthal genes" slowly removed them from our genome. Graham Coop, senior author on the paper published in PLOS Genetics, points out that a much smaller population of Neanderthals was mixing with a large group of modern humans. Genes that are slightly harmful can remain common among a small, inbred group, he explained. Once they mix into a larger genome, they are gradually purged by more beneficial variants. The findings highlight the role population size plays in evolution, and adds to our understanding of our extinct close relative.